HCM CITY – Many business opportunities are on offer to fisheries processors and traders at the 2016 Vietfish exhibition which opened in HCM City yesterday (August 3). The biggest industry event, Vietfish has attracted around 200 seafood exporters and processors from Việt Nam and 11 other countries and territories. Organised by the Việt Nam Association of Seafood Exporters and Processors (VASEP) to connect domestic and foreign seafood companies, it is the 17th annual event. 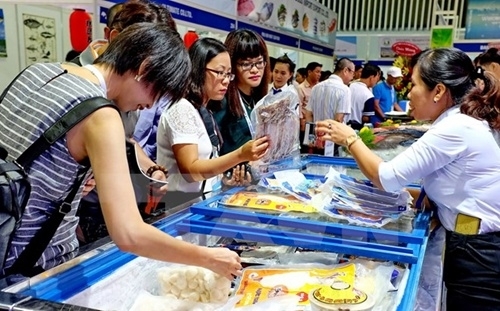 Under the theme “Asia’s Home Seafood,” the exhibition this year has 350 booths set up by companies from Việt Nam, Malaysia, Thailand, China, Germany, Japan, the US, Singapore, Indonesia, and the Philippines. Vietfish provides visitors the chance to try delicious dishes made from tra fish, shrimp, tuna, cuttlefish, and octopus. At the three-day event many conferences will be organised to discuss urgent issues related to seafood certification and use of technology. From them companies can learn about the latest technologies and newest trends in the world fisheries market, enabling them to upgrade their production and strengthen their business. “After 17 years Vietfish has received positive feedback from the public and has developed its operational plans in an effective way,” a VASEP spokesperson said. In the 1990s, when Vietnamese companies, mostly State-owned, began to export seafood, the value was a mere US$30 million. Twenty years later, in 2014, the figure topped $8 billion. By then over 600 companies using the most advanced technologies in the world had been established. Việt Nam is now among the biggest tra/basa fish and shrimp exporters in the world. It is a market that can meet the demand for all kinds of seafood like cuttlefish, tuna and other fishes, meaning importers can save time and money. This year VASEP has forecast exports turnover will reach over $7 billion, up 6.3 per cent over 2015.